One of our favorite external effects processors in the studio, and we’re sure many other engineers in the industry could agree, is the Eventide Ultra Harmonizer DSP 4000. From processing vocals & instruments to radical sound manipulation and design, the DSP 4000 has been a staple in the recording & post industry since the mid nineties. The timeline of the Ultra­Harmonizer originally dates back to 1975 when Eventide first released the H910 which became a studio standard for its unique pitch & delay processing & effects. Sometime later, the H949 was released. Eventually, the H3000 series was released, becoming the industry standard due to the massive range of uses it possessed all at a 16­bit res, 44.1kHz sampling rate capturing a frequency response of 5Hz to 20kHz. 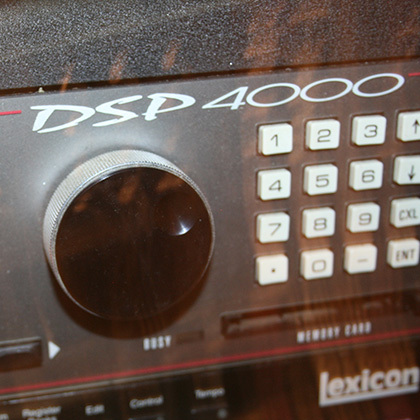 In the late 90’s, the DSP 4000 was introduced as an upgrade to the powerful H3000. The DSP 4000 is either a dual mono or single stereo channel unit. It has 2 XLR Ins/Outs, AES In/Out, SPDIF, and Midi In/Out. Inside the DSP 4000, there are dozens of audio environments to choose from with hundreds of built in user friendly presets from ghostly voices, tape slowdown, to vocal doublers, compression and more. You can also write totally new user­programmable effects algorithms by linking over 130 different internal modular effects together. User presets can be easily saved and accessed to and from either the DSP 4000 or an Eventide memory card. All presets and effect parameters can be programmed to sync to midi, which is great for delay and modulation effects. You can also plug in a midi keyboard to the DSP 4000 to trigger and manipulate effects as well. In addition to effects and signal processing the DSP 4000 also has a multi sampler option with two different sampling ranges. We found the sampling function is real good for looping fx’s, delays, creating harmonies and new melodies. Do you need to throw a big bag of tricks into your track, but are board by doing the same old thing in your computer. Give us a call.